The new addition in Menu is Paldesk Apps. 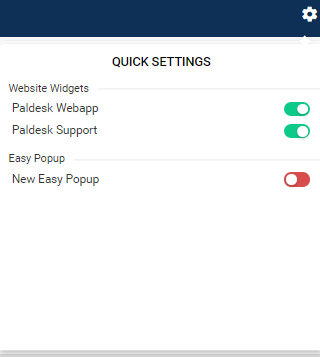 When users go on Quick setup, they can easily install Paldesk Desktop applications, whether on Windows, macOS or Unix. Paldesk Desktop application is synchronized with mobile application and application in the web browser. If you need to change your settings real quick, this is the way. With this new feature, you can hide/show or turn on/off Website Widget and Easy Popup with only one click. Both are basic features and can be used for free, without any additional restrictions.